Ohio recently changed the way it rates schools, going to an A-F grading system that is supposed to make it easier for parents, taxpayers and the community to understand how well each school performs. There are two key measurements which quickly communicate the overall school quality: the performance index and the value-added rating. Performance is easier to understand, since it’s similar to a grade-point average. It’s a snapshot of student achievement within a school at a particular point in time. Value-added ratings are a bit more complicated. They are an estimate of the school’s impact on achievement tracked over a period of time. It’s supposed to show if students are improving their performance (actually learning) year after year. District schools do better than charter schools. Charter schools do better than district ones. Kids are leaving good district schools to go to bad charter schools. You name it and someone probably said it about what the new report cards really mean. Then along came The Thomas B. Fordham Institute, an Ohio-based think tank that promotes educational excellence for every child. They decided to objectively compare the educational options in the eight largest Ohio cities – Akron, Canton, Cincinnati, Cleveland, Columbus, Dayton, Toledo, and Youngstown – and what they found is disappointing. High quality urban schools of any variety – district or charter – are not the norm, their report says. And the number of high-quality seats (the proportion of Ohio students who attend high-quality schools) are nowhere near as prevalent as low-quality ones. And what about the public charter schools in those cities? But that doesn’t mean that district schools were any better. In Cleveland, 51 percent of the traditional public school seats were low quality. 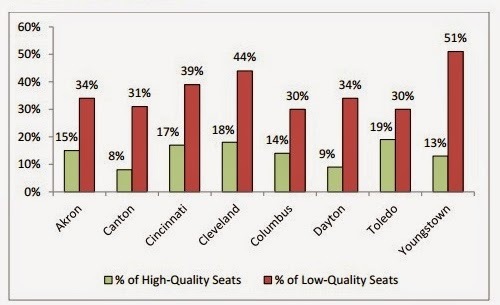 Cincinnati had 36 percent while Columbus and Toledo had 33 percent low-quality seats. Overall, the analysis found that charter had a higher proportion of high quality seats (22 percent) than traditional district schools (13 percent). Charters also had a lower proportion of low-quality seats (32 percent) than the 38 percent of low-quality seats found in the district schools. Why are high- and low-quality seats important? “…so that state and city leaders can grasp how many good schools must be created, or present ones expanded, to give every student the academic opportunities she needs,” the report explains. As rigorous new standards and assessment testing take effect, the report predicts that proficiency ratings will fall, but that they’ll provide a more honest view of student progress. Hard to defend when you consider 8 out of the 8 largest school districts in the state of Ohio have earned an "F"